this time ‘sharing and caring instead of dealing and stealing’. and the salutary effects of folly. Their study includes the nature of celebration, feasting and extravagance in different cultures. supposedly an ‘earthly paradise’ full of gold and riches. In vain! Now, the Ship of Fools Azart sails as a contemporary East Indiaman for the eleventh expedition. The South Land proved to be Australia and their cargo the immaterial wealth ​​of an artistic and cultural exchange between artists and audiences of different cultures. In many a city the crew builds a temporary festive fortress on the quay to celebrate a Festival of Fools. 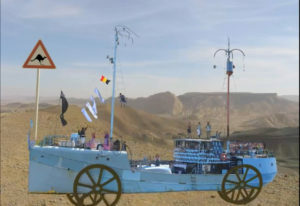 as a gigantic mobile sculpture dedicated to folly. as the emblem of the thousand-year European carnival culture.